YWCA of Bristol is the only YWCA which exists between Lynchburg, Virginia and Knoxville, Tennessee. On an annual basis, the YWCA of Bristol provides programs for the empowerment of women while combating racism within Southwest Virginia and Northeast Tennessee. Recently, nine members from the community at large were chosen as they represented and fulfilled characteristics of “Nurture, Empowerment and Transformation” during the 27th annual YWCA’s Tribute to Women event located at the Bristol Train Station. Approximately 300 people were in attendance at this year’s event to celebrate and reflect on the progress and accomplishments these nine nominees contributed to the region. Strongwell was listed as the “Protector of Peace” patron this year. 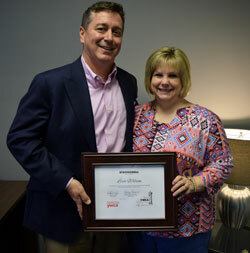 Strongwell would like to congratulate its employee honoree, Lisa Wilson (Human Resources Generalist and Corporate Hourly Payroll Administrator-Bristol) for her continuous improvement efforts to Strongwell and the positive effect she has within her family and community. Many thanks to the YWCA of Bristol for all its efforts for the community.